It is no surprise that Goa is one of the most sought-after destinations not only in India but the world simply because it offers the best of everything that one is looking for. Miles of golden sand coastline, expansive sea, a fun-filled party-scene and countless options to drink and dine all make it one of the most preferred destinations for adults and kids alike. And while you thought that a trip to the beach would be all about a relaxed, slow sea-gazing and indulge in some scrumptious food, it would do well to give a look at some of the most adrenaline-pumping and thrilling activities that could find a place on your bucket list of 'Things to Do' while travelling to Goa. It hardly matters whether one is a swimmer or more of a trekker, an out and out adventurous person or the more cautious one but open to trying out experiences, Goa will leave you spoilt for choices. The Pequeno or Bat Island of Goa is a very popular destination for many holiday makers around the world. The Pequeno Island is a great place for tourists to visit, especially those who are looking for some adventure while they are holidaying in Goa. The Pequeno Island has mostly rocky beaches, but they are strikingly beautiful. There is also a small stretch of greenery on the island. If you are into adventure and water sports, you would love snorkelling in the sea around the Pequeno Island. 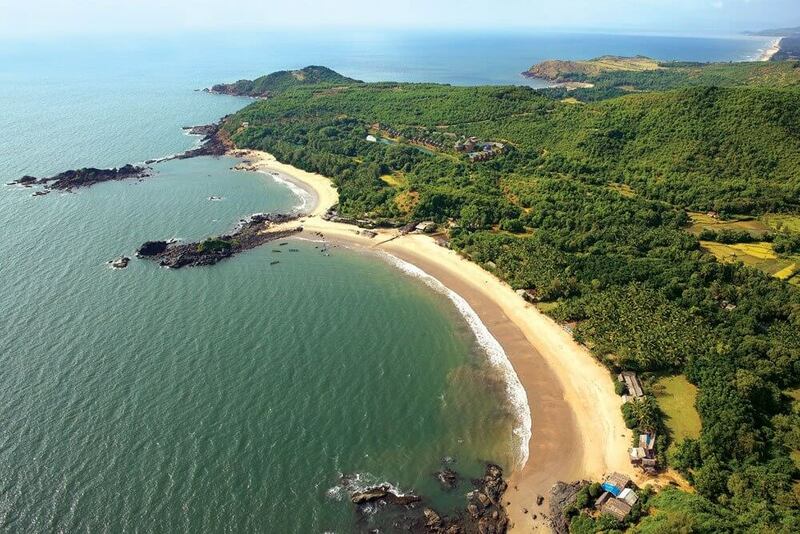 It is a perfect place for snorkelling in the whole of major Goan destinations. The Bat Island is also known as the "Bat Island Party Destination of Goa or Vasco". Advisory: In case of any injury or illness, do not participate in the activity. Consumption of alcohol or any other intoxicating products is strictly prohibited during this trip. If the sublime experience of marine life and the enchanting world of underwater caught your fancy while watching 'Zindagi Na Milegi Dobara', scuba diving is the sport for you. Colourful corals, wrecks from the pages of history and the thrill of being in the abandon of the infinite sea, scuba diving is a once-in-a-lifetime experience. And here' s the thing: You don't need to dish out a moolah for this sport in countries like Maldives or Thailand when Goa offers you stunning experience of marine life while scuba diving with the best of instructors and safety equipment. You will be required to participate in a 1-hour long training session with the instructors after which you will be all set for the sport 12 meters down the sea. It is advisable to go for scuba diving between October to May when the seawaters are not rough. Places offering Scuba Diving: Grande Island, Agatti Island, Pigeon Island. Shallow sites near Malyan and Venugurla are located at a distance of about 2 hours from Panaji- the capital of Goa. Angria Bank is located 120 km from Goa is a world-class diving site. Other sites include Suzy's Wreck, Turbo Tunnel, Sail Rock and Davy Jones Locker. Notable Operators:Dive Goa (Candolim); Goa Diving (Bogmalo, Vasco); Goa Yatra (Arpora); Aqua Sports (Calangute); Scuba Evolution India (Candolim). Approximate Cost: INR 3999 per person. While you thought that a beach place like Goa would offer the adventure of the sea and sand, you might want to check out options for hiking that attract a lot of young people here. Long trails of walking on tracks that are challenging can be a lot of fun when done in groups and with proper gear. Mahavir Wildlife Sanctuary and Mollem National Park offer good destinations for hiking. Trekking to Dudhsagar Falls is especially popular along the route originating from Devil's Canyon. Located at a height of 560 meters, Vagheri Peaks is another favourite among the trekkers that excites through its rugged terrains and tests one' s endurance both mentally and physically. Netravali Wildlife Sanctuary is located at a distance of about 2 hours, which offers spectacular views of the forests, flora and fauna and wildlife in its full bounty. Trekking and hiking require a good level of physical fitness and is truly a memorable experience. Make sure that you invest in proper footwear, comfortable clothes and essentials like insect repellents, sunscreen and sunglasses. 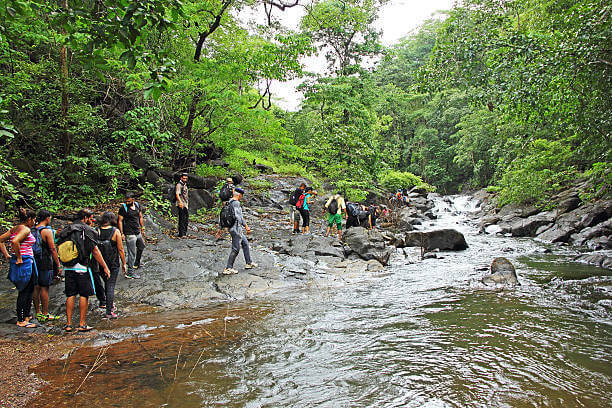 Hiking and trekking in Goa must be avoided in monsoons, as the terrains usually get slushy making it difficult to walk and climb. Places for Hiking and Trekking:Todo waterfalls, Udaan Dongor, Dudhsagar waterfalls, Mollem National Park, Netravali Wildlife Sanctuary, Collem. Tour Operators: Atlantis Water sports; Seawater Sports. Many private hotels and resorts also have arrangements from the same. Approximate Cost:Day tours to Dudhsagar and national parks start from INR 2000 and can go up to INR 5000. A hidden land of adventure, peppered with some stunning views & aquatic life. The beauty of the hidden gem has an aura of calmness and bliss attached to it. Semi-circle shaped landscape, millions of butterflies flying over the hilltop blossoms, and acrobatics of the dolphins around ensure a wonderful experience at this Beach in Goa. The semi-circular shape and the fact that is accessed by a boat ride give the tourists an impression of an island. Just to confirm, it is NOT an island. It is a beach, situated north of Palolem beach. In fact, it is one of the most beautiful beaches in South Goa. However, it is easier to reach the beach by a boat ride from the nearby beaches as the land journey involves a challenging forest hike. And if you’re done enjoying the marine life, there are some amazing sunset views that one can enjoy from the hidden beach. We have repeatedly mentioned the beach to be a secret. Wondering why? Well, the tiny beach cove of white sands & translucent waters is heavily forested. Vehicles, not even the two-wheelers or ATVs can make the trip that goes through water bodies, steep climbs, fields, and forested areas. Butterfly beach is the abode of numerous beautiful butterflies. But what the name doesn’t tell us is that during low tides, when the seashore widens, the beach is littered with crabs and goldfishes. Sea urchins, sea cucumbers, and even redfish are common sights here. One might find some private rave parties happening on the beach. And yes, its privacy is a boon for the romantic couples as well. Kayaking is a calming water activity that is not strenuous and too challenging. Paddle your way through the thickets, backwaters and rivulets in Goa enjoying its scenic beauty and scenes from the daily Goan life. Kayak races, kayak festivals, picnics and moonlight kayaking are some of the options offered by various clubs in Goa. It is more popular in South Goa beaches and is best enjoyed in the season stretching from October to May when the sea is placid, and the currents are moderate. Places Offering Kayaking: Palolem Beach, Dona Paula jetty, Hollant Beach, Nerul river, backwaters of Zuari, Sal and Mandovi. 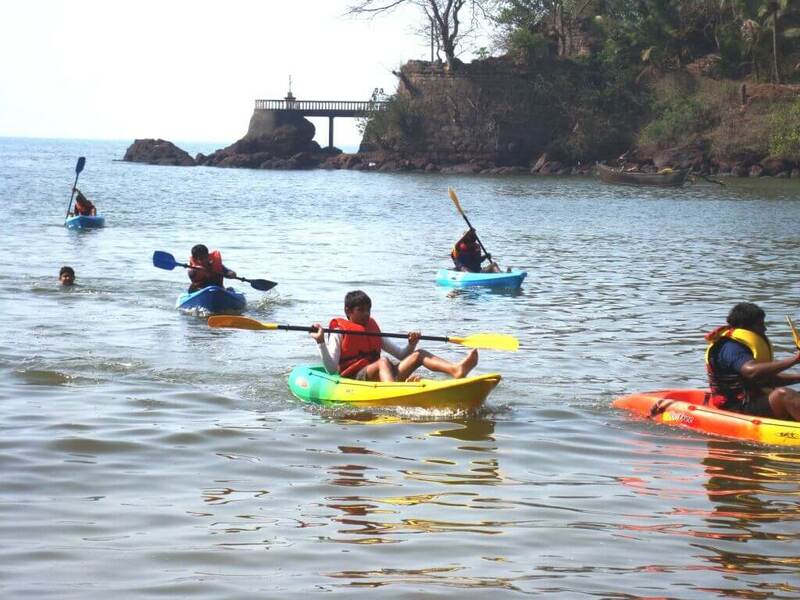 Operators:Hydro Sports (Dona Paula); Goa Kayaking (Vasco de Gama). Approximate Cost: INR 1600-3200 per person. A sport that is widely popular in the rivers at the mountainous regions is now a popular monsoon adventure sport at Goa. 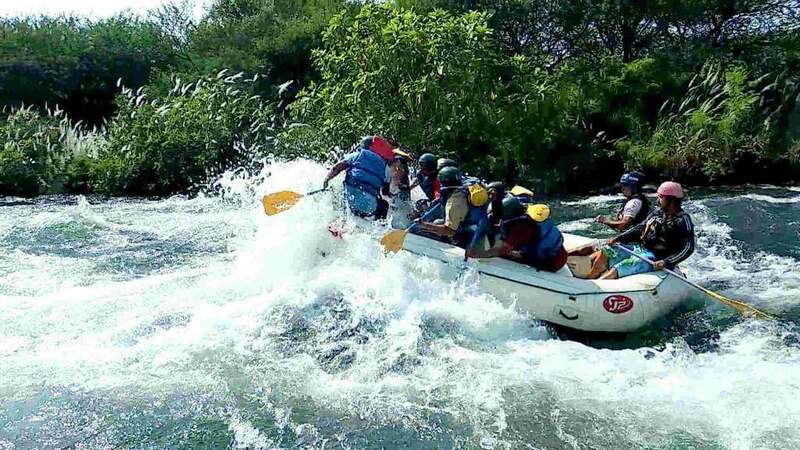 Highly thrilling and highly enjoyable, water rafting is a group activity that not only gives one adrenaline rush but also teaches to work in a group. The white water rafting on the Mahadei/ Mandovi River in Goa provides the gleam of fast-moving clear water which is a beautiful sight to be a part of. Minimum number of 6 guests to run a trip. Maximum number of seats per trip is 20. Price: INR 1,799 (without transport) – INR 2699 (with transport). Who doesn't want to enjoy the breath-taking view of the blue Arabian Sea while flying high up in the sky, defying the limits as it were? Parasailing is one of the most popular adventure sports on offer in Goa. Tourists usually prefer winch boat parasailing where the taking off and landing of the parachute happens on the winch boat itself attached at the other end of the parachute. 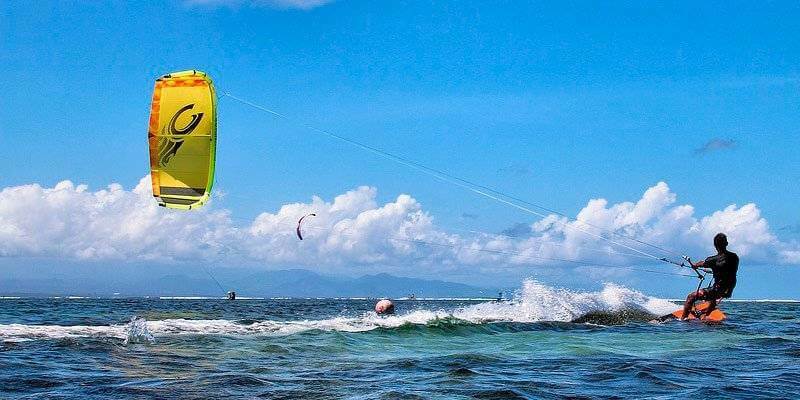 Parasailing is a hot favourite amongst families, kids and couples as it offers the perfect combination of thrill and enjoyment while being comparatively easier than the other water sports. The best time to enjoy parasailing is from October to May when the sea is calmer, and winds are perfect to glide the parachute. 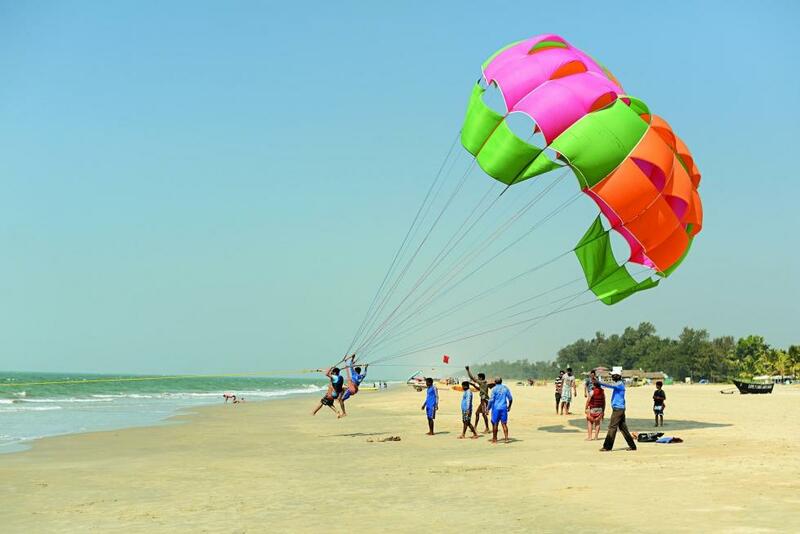 Places offering Parasailing: Arambol Beach, Baga Beach, Mobor, Dona Paula. Notable Operators:Goan Banana's Watersports (Baga, Candolim and Calangute); Hydro Sports (Dona Paula); Goa Tours Planner (Calangute), Sea Water Sports (Arpora). Approximate Cost: INR 850 - 1100. Kite Surfing is a combination of surfing, jet skiing and wakeboarding. This sport is quite challenging and is open only to adults. This sport must be practised under the supervision of trainers to manoeuvre the power kite. Kitesurfing can be done preferably in the morning during the season when the winds are not too gusty and aid the surfing process. Places Offering Kite Surfing: Mondego Bay, Morjim, Arambol. Notable Operators:Banana Surf School (Ashvem); Waterwalk India (Mandrem); Surf Wala- Day Surfing (Arambol); Kitesurfing Goa (Pernem). Approximate Cost: INR 2500 onwards. 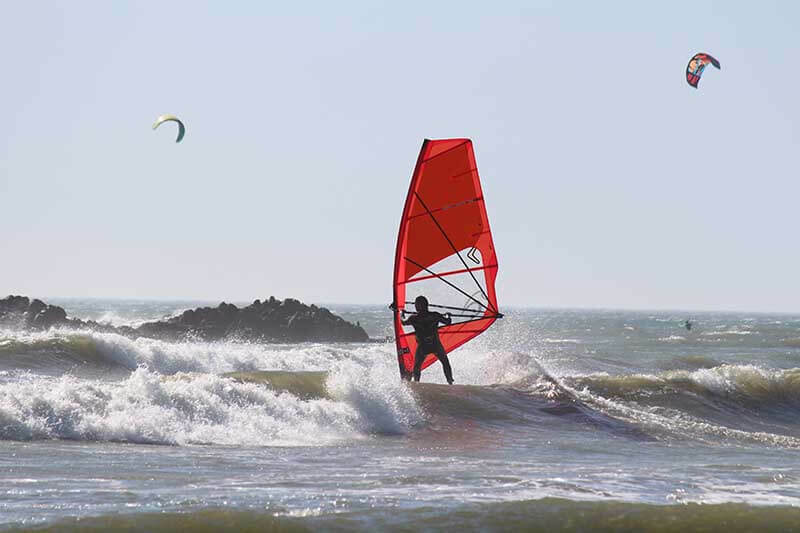 Windsurfing combines the aspects of both sailing and surfing. The rider has to stand on the board and firmly grip the sail attached and then manoeuvre according to the wind and water pressure. It requires a good balancing act on the surfboard while cruising through the ocean waters. Dona Paula jetty among others such as Candolim Beach, Calangute and Baga is considered to be the best place for windsurfing especially if you are a beginner. If you are more adventurous types, you could head out for windsurfing in the afternoon instead of the morning when the winds are stronger and offer a more challenging experience to the surfers. Places Offering Windsurfing: Dona Paula jetty, Miramar, Bogmalo, Vagator, Palolem. Notable Operators: Atlantis Water sports; Octopus Surf School (Morjim); Sea Water Sports (Arpora). Approximate Cost: INR 1500 onwards. This water sport is relatively easy and catches the attention of adults and children alike. Not more than two individuals are encased in an inflatable balloon or a zorb, which floats on the water. While it may sound very easy, maintaining balance inside the zorb is quite challenging and it requires effort to walk over water. You could also play Zoccer which is a spin-off version of soccer in water. 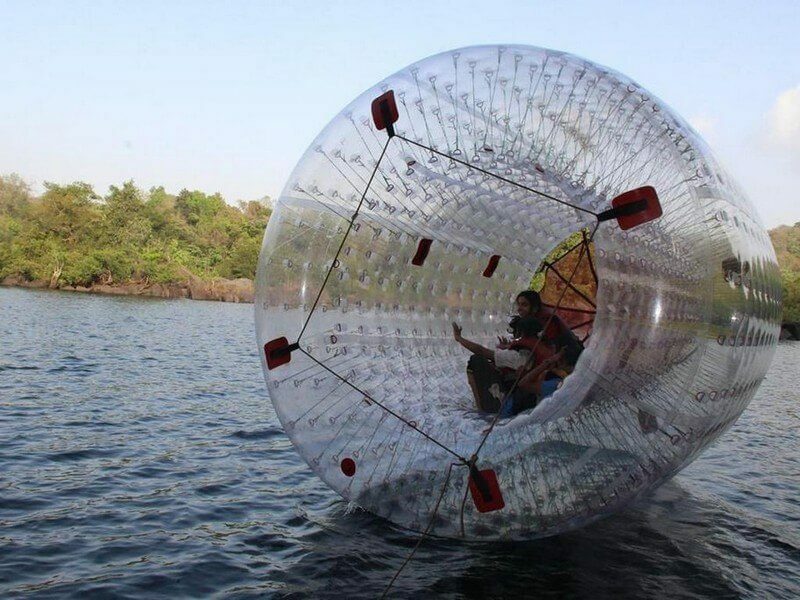 Extremely enjoyable and also a great exercise, water zorbing is safe, fun and a great activity to try out while in Goa. Places offering Water Zorbing:Mayem Lake; swimming pools of certain hotels and resorts such as Grand Hyatt and Vivanta by Taj, Fort Aguada. Approximate Cost: INR 500 - INR 1500. One can enjoy breath-taking views of Goa in huge balloons inflated with hot air and flying at a high-altitude of 2500 feet. Make sure to travel with a trained ground crew that follows you until the safe landing of the balloon back on the ground. Hot air ballooning is more popular in south Goa especially for sunrise flights preferred by honeymoon couples. 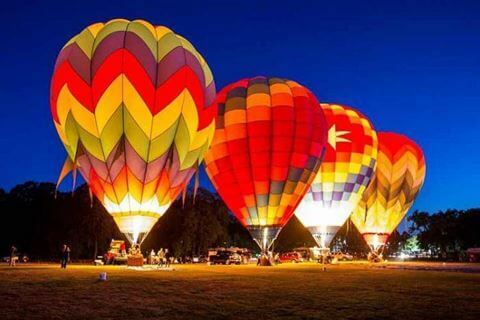 Places Offering Hot Air Ballooning:Asolda Ground, Chandor, South Goa. Notable Operators: Tiger Balloon Safaris (Panjim); Seawater Sports (Arpora). Approximate Cost: INR 9000 - INR 11000 per person. Adventure sports in Goa are usually open in the dry season of October to March when the sea is placid and winds are in control. Look out for good deals online as well as through local agents. If you are a seasoned adventure sports enthusiast, you could opt for activities such as ATV Biking, trekking and speedboat sailing even during monsoons. Always wear comfortable clothes (such as well-fitted shorts and t-shirts) and carry sunscreen, hat and sunglasses when indulging in these activities. Whether you are a relaxed first timer or an adventurous water skiing expert, the waters of Goa have something for everyone. We hope you have a great time.